“YOYO: You’re On Your Own. We can’t count on first responders. 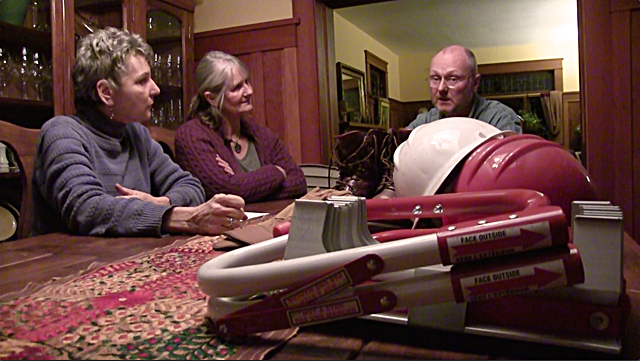 Their focus is on critical resources.” Ann Pacey and Tim Beale show their “second-story kit” in case of earthquakes. Noting that a key injury is broken glass, they have boots, gloves, flashlight and hard hat under their upstairs bed. Plus a folding ladder to get to the ground in case they can’t get downstairs. They discuss good books, a folding shopping cart for easy mobility, and neighbors assisting one another. When their cat jumps onto the table, they discuss planning for pets in emergencies, too!